One of Lahaina's best preserved 19th-century landmarks, the house in Front Street built by Rev. Dwight Baldwin in 1834, stands now as the oldest house in Maui. Baldwin was a missionary who started a farm on the island and was responsible for growing the first plantations of Hawaii's indigenous pineapples, the fruit that is now enjoyed worldwide. Baldwin's home gives an insight into island life in the missionary era. Alongside is the Master's Reading Room, another of Maui's oldest buildings, which used to be frequented by visiting sea captains when missionaries closed down seafront bars in the early 19th century. 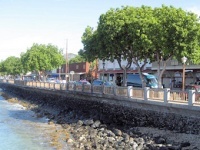 The building is now occupied by the Lahaina Restoration Foundation, which issues maps and guides for visitors wishing to take a walking tour around Lahaina's historic attractions. Admission: $7 general admission; concessions are available.